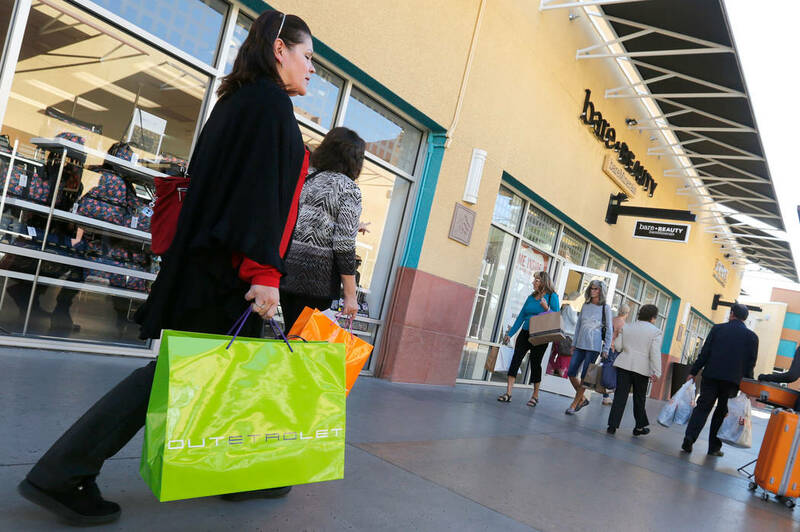 Retail analysts said Southern Nevada’s economy remains strong and expect holiday sales here to be stronger than the nation as a whole. Buck Wargo interviews Matt Bear the vice president of retail for CBRE. Chitose Suzuki RJRealEstate.Vegas Shoppers walk through Las Vegas North Premium Outlets in Las Vegas Nov. 15. That’s a synopsis from a group of CBRE researchers, economists and analysts during a Nov. 3 presentation at the Howard Hughes Center. The National Retail Federation projects retail sales during the holiday season will increase between 3.6 percent to 4 percent, according to Melina Cordero, CBRE’s head of retail research, Americas. The federation predicted 3.5 percent growth in 2016, which provide to be correct, she said. Matt Vance, CBRE economist and director of research and analysis, said Moody’s research pegs the Las Vegas retail growth for the year approaching 4 percent, which is above the projection for the nation as a whole. That should translate into Southern Nevada continuing to outpace the nation even during the holiday shopping season, he said. “There’s so much evidence to the tailwinds of the economy right now, locally, that there’s no reason to believe that Vegas’s story will suddenly reverse itself and underperform the nation,” Vance said. Historically, the long-term growth rate of retail goods and restaurant sales in Las Vegas is 7 percent, Vance said. It’s expected to be about 5 percent over the next six years, which is a reflection of percentages getting smaller the larger a market becomes, he said. “This is a market that has a lot of momentum from a lot of different angles,” Vance said. Matt Bear, CBRE’s vice president of global gaming and retail, agreed that Las Vegas is well-positioned for additional growth and will surpass the rest of the nation during the holidays because of the strength of its economy. In its third quarter report for Las Vegas retail, CBRE said the vacancy rate fell 20 basis points to 8.7 percent and nearly 500,000 square feet of space was absorbed. Some 1.23 million square feet remains under construction. As for expectations of the holiday shopping season, Cordero said the categories expected to do well are the ones doing well now — health and beauty and home furnishings. Cordero said consumer buying habits have changed since the recession. They’ve turned to discount and off-price sales and didn’t go back to full price since the economy has recovered, she said. What that means is the mid-range brands are the ones struggling, Cordero said. In looking at the closures and bankruptcies over the last 18 to 24 months, many are in that soft goods and mid-price bracket, Cordero said. The department stores that have announced closures, include Macy’s, J.C. Penney and Sears, she said. Cordero said retail spending by millennials continues to impact retail because they don’t want to spend more than $10 on a T-shirt and would rather spend money on gym membership, restaurants and Uber. That has prompted mall owners to partner with third parties, like Uber to get people to the mall for free if they spend above a certain amount. Malls also are setting up staged displays where millennials can take pictures for posting on social media that becomes viral and drives traffic to the mall, Cordero said. Despite the growth of e-commerce, no one should expect an end to brick-and-mortar stores, Cordero said. Some analysts fear that because e-commerce comprises 8.5 to 9 percent of retail sales and has grown at 15 percent a year since 2010. In contrast, brick-and- mortar sales have grown at 4 percent a year over the same period, she said. Retailers will invest in e-commerce platforms and mobile strategies will be bigger in the future, Cordero said. In 2018, for example, mobile commerce will account for 35 to 40 percent of online sales, she said. What’s changing and fascinating to watch, Cordero said, is the merger of the retail and industrial sectors. As retailers do more online, they’re changing the distribution and supply chains. The old model of one major hub in the middle of the country to service all of its stores won’t work if retailers are trying to get products to consumers quickly. They’re dispersing their distribution footprint with smaller hubs closer to consumers, especially on the coasts, to become “more nimble and agile,” she said. That’s prompting more demand for industrial space, especially in markets like Las Vegas, Cordero said. In its third-quarter market report, CBRE said Las Vegas is recording record growth in the industrial sector. There was 2.7 million square feet of net absorption in the quarter and it’s reached 5.7 million for the year, the highest in history. That demand is expected to continue, and the region has a 4 percent vacancy rate, according to CBRE. There’s nearly 4 million square feet under construction. JJ Peck, CBRE’s research manager, said most of the new industrial construction is in North Las Vegas and is attributed to e-commerce, with Southern Nevada serving a regional distribution hub for major retailers. “We’re seeing unprecedented transactions that we’ve have never seen before,” Peck said. In his assessment on the nation’s economy, Vance said it’s headed for “slower times,” and pointed to monthly jobs reports that shows a deceleration in employment, especially as employers have trouble finding talent to fill jobs. There are concerns about rising interest rates and the rising value of the dollar, he said. The economy will remain stable through 2018 but could go into recession by mid-2019 and emerge in 2020, he said. While that may happen on a national level, Las Vegas’ economy could decelerate but not go into recession, Vance said. “The folks at Moody’s that look closely at every market at no point forecast any negative contraction, locally,” Vance said. That’s a bold statement considering the region has suffered in previous recessions, but Bear said only banking woes and lack of capital would hurt Las Vegas at this time given construction projects and casino expansion planned along the Strip. Las Vegas is in a good position because its job growth is above the national average, Vance said. He said it’s an example of what’s happening in the Mountain region away from the coastal states with people migrating from California, Washington and New York to Nevada. That’s bolstered by jobs growing at twice the national average. He said the 30,000 jobs a year being added in Las Vegas is 50 percent higher than its long-term average. Las Vegas has had nearly 84,000 people migrate from other states between 2012 and 2016, Vance said. That’s 16,700 a year or 46 people a day of people taking advantage of the affordability in the market, he said. “Those are big numbers creating a lot of housing demand and contributing to the job growth,” Vance said. The median age of those moving to Las Vegas has increased from 35.5 to 36.5, which Vance said is a good sign because the region is attracting a mix of young and old. That lends itself to more stable growth going forward in contrast to Phoenix that has seen its median age of moving people into the state increase by three years, he said. “Having a uniform distribution of age is beneficial for five to 15 years going forward,” Vance said.